If you’re looking for a birdwatching break in Britain’s best birding county or to sample some of the UK’s finest birdwatching areas, we have something to offer you in 2008/9. 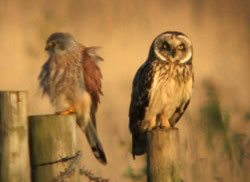 Our Norfolk based tours provide the whole cross-section of Norfolks special birds and habitats, and are based in comfortable en suite hotel and B&B accommodation in the village of East Barsham. Expert leadership from Ashley Saunders, relaxed pace and small groups make our tours a great success, so why not come and join us this year and see why so many clients keep coming back! This year we are travelling to North-east England, Solway, South & North Wales, Cornwall (Feb, Aug & Oct), Mull & Iona, Speyside and Ireland while our liason with Celtic Bird Tours see's us visiting Mallorca, Israel, Extremadura, South Africa and The Gambia. Take a look at our website www.orioleadventures.com for more details. We can also offer single day tours for people with less time, and are always happy to be flexible to accommodate your exact requirements on any of our tours, when possible. Ashley will also arrange customised tours for small groups of birders who wish to visit a particular UK region, or see a particular bird or group of birds. Read on for some examples of forthcoming trips, prices are per person and include food, accommodation, transport and guidance. Winter is a fantastic time to be birding in Norfolk, as our coastal fields and marshes become a haven for over 100,000 Pink-footed Geese from Iceland, huge flocks of Dark-bellied Brent Geese, European White-fronts, and even scarce Taiga Bean Goose here in one of its UK strongholds. 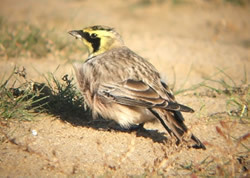 Out on the saltings, beautiful Shorelark may be found, often accommpanied by Snow Buntings while offshore we search for flocks of Scoters and a variety of grebes, divers and other seaduck. Raptors are a major feature with the spectacular roost in the Broads attracting up to 50 Marsh Harriers, 5 Hen Harriers, 3 Merlin, Peregrine, Barn and Short-eared Owls, not to mention the UK's only resident Common Cranes! Add Hawfinch and Crossbill in Breckland, and visits to famous Cley and Titchwell reserves and you can see why our winter trips are so popular! North-east Grand Tour 29th May - 4th June & 5th - 11th June 2009, £699 per person, £75 single supplement. 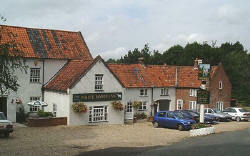 We are running our ninth tour to this magical region in 2009 following the huge success of our customised trip in 2004. This two base, three county tour begins in East Yorkshire where we seek migrants at Spurn Point and Flamborough Head often including a Red-backed Shrike or Bluethroat at this time of year, and visit the spectacular seabird colonies at Bempton Cliffs RSPB. Our Georgian Farmhouse base has a garden filled with Tree Sparrows and we had an Osprey here in 2006! Passing through County Durham we pause to watch stunning Black Grouse in the spectacular setting of Teesdale, with Ring Ouzel, Red Grouse and some of the highest densities of breeding waders in Britain also encountered. Our second base in the beautiful Coquet Valley of Northumberland allows us to explore the valleys around the Cheviot Hills where Redstart, Pied & Spotted Flycatcher, Whinchat, Tree Pipit, Redpoll, Garden Warbler, Goosander, Ring Ouzel and Dipper are found. From Seahouses, we spend half a day touring the magical Farne Islands, being bombarded by Arctic Terns, walking feet away from nesting Eider and standing within feet of breeding Puffin, Guillemot, Razorbill, Shag and Kittiwake on the cliffs. 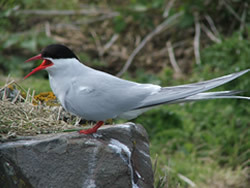 Our second boat trip to RSPB Coquet Island to see the Roseate Terns is the icing on the cake of an amazing holiday! Norfolk Breckland & Coastal, Spring Migration, Complete Tour, Rare Breeders, Butterflies & Dragonflies, Shorebird Spectacular, Autumn Migration, Late Autumn Special & Birds & Xmas Music tours.